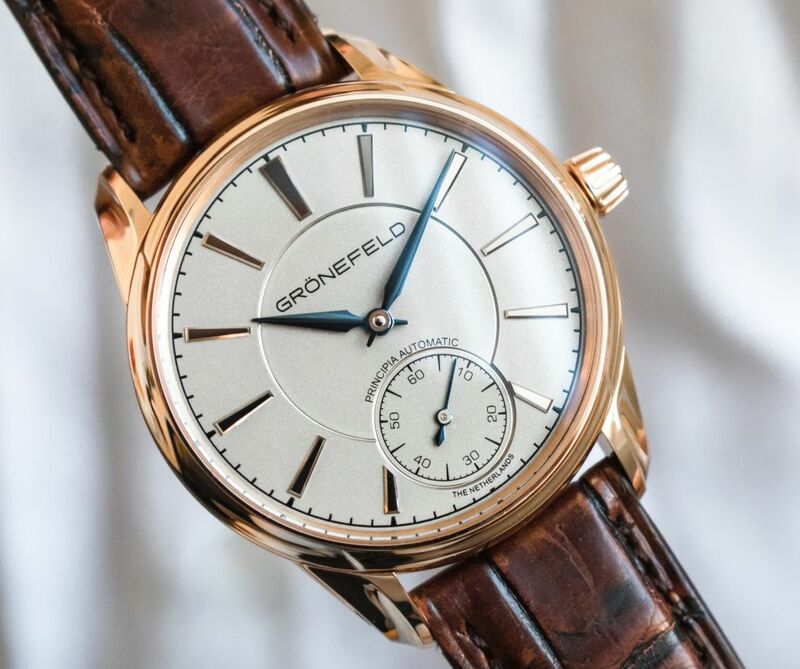 Almost three years after the release of their multiple award winning 1941 Remontoire, Bart and Tim Grönefeld are pleased to reveal their first automatic watch the "1941 Principia". The Philosophiæ Naturalis Principia Mathematica often referred to as simply the Principia, is a body of work by Sir Isaac Newton, delivered in three books. Written in Latin, the Principia formulated the laws of motion and universal gravitation. This Newton's scientific study is the foundation of classical mechanics and it led the Horological Brothers to select the "Principia" name for their first watch with automatic winding mechanism. The case, in 18kt red or white gold, or in stainless steel, measures 39.5mm x 10.5mm. It has doulbe sapphire crystals and it is water resistant to 30 meters. 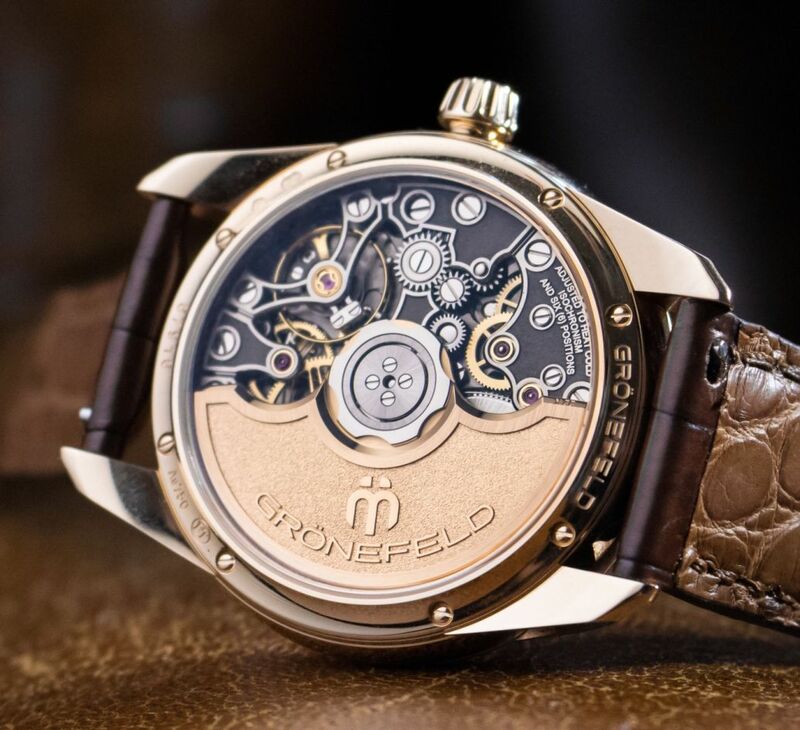 Movement is a Dutch automatic Gronefeld in-house caliber with 31 jewels (partially set in solid gold chatons), 21,600 vph and a power reserve of 56 hours. It is comprised of 226 parts. It has a 22kt solid red gold rotor pivoted on a high precision ceramic ball bearing to avoid excessive wear and the need for lubrication. Variable-inertia balance wheel with four white gold timing screws. Free sprung balance spring with Phillips terminal overcoil curve with triangle hairspring stud. Jewelled Swiss lever escapement. Spotted and ruthenium electroplated brass main plate. Steel bridges, bevels polished by hand, micro-blasted center, circular grain on the top to highlight the bridges shapes and relief engravings. The escapement is adjusted to heat-cold, isochronism and six positions. Mirror polished screws feature chamfered rims and slots. The inventory of different decorations includes snailed, grained, spotted and frosted surfaces. Each movement is finished and assembled by hand. 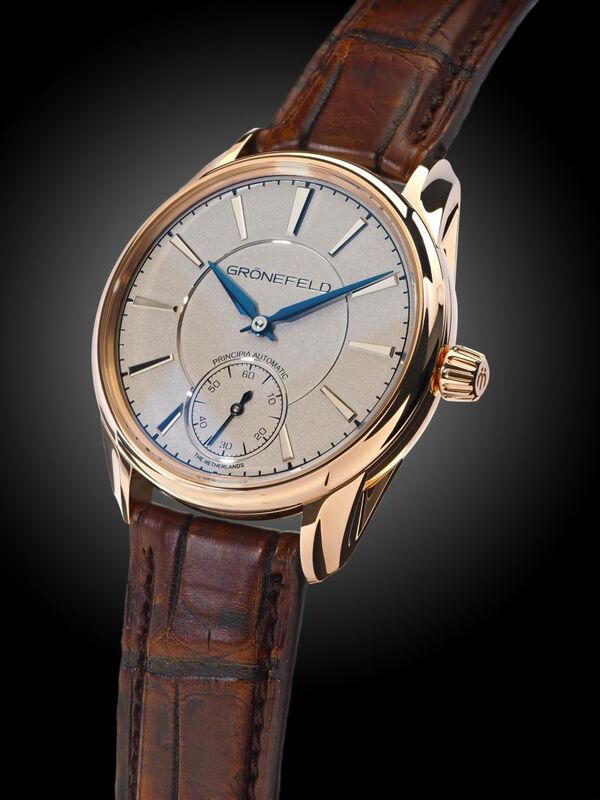 To emphasize the manual labour a gold plate, engraved with an individual number, is applied to the movement. The dial is solid sterling silver. 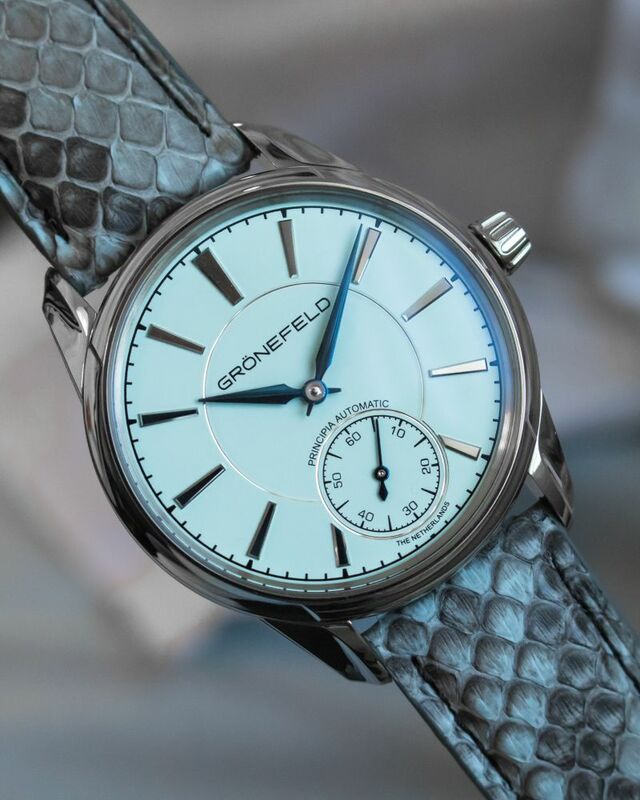 Options include a cream lacquered dial with Roman numerals, a matte turquoise or light blue dial with polished applied baton hour markers. 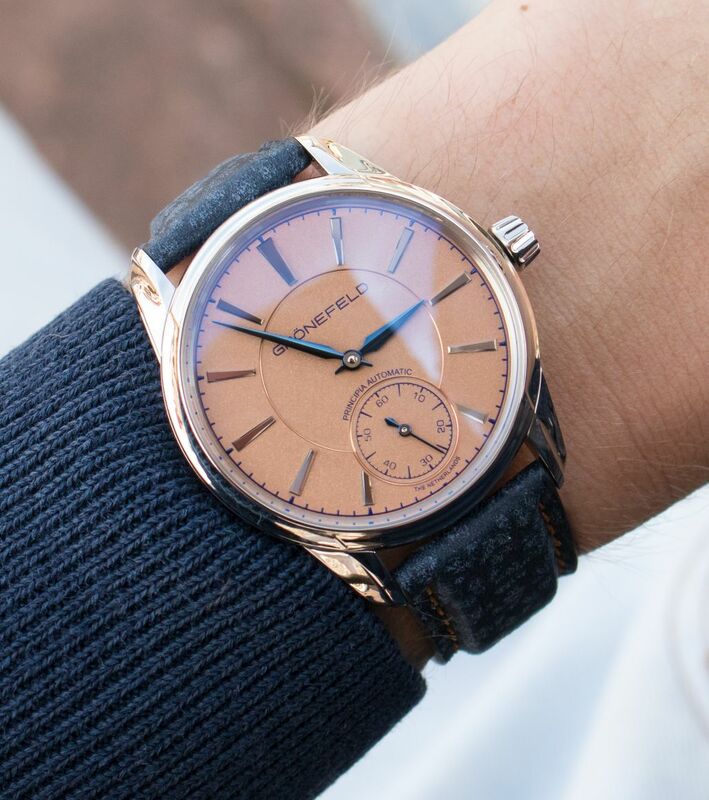 Alternatively, the company's rhodium plated or gold plated salmon dials are also available. 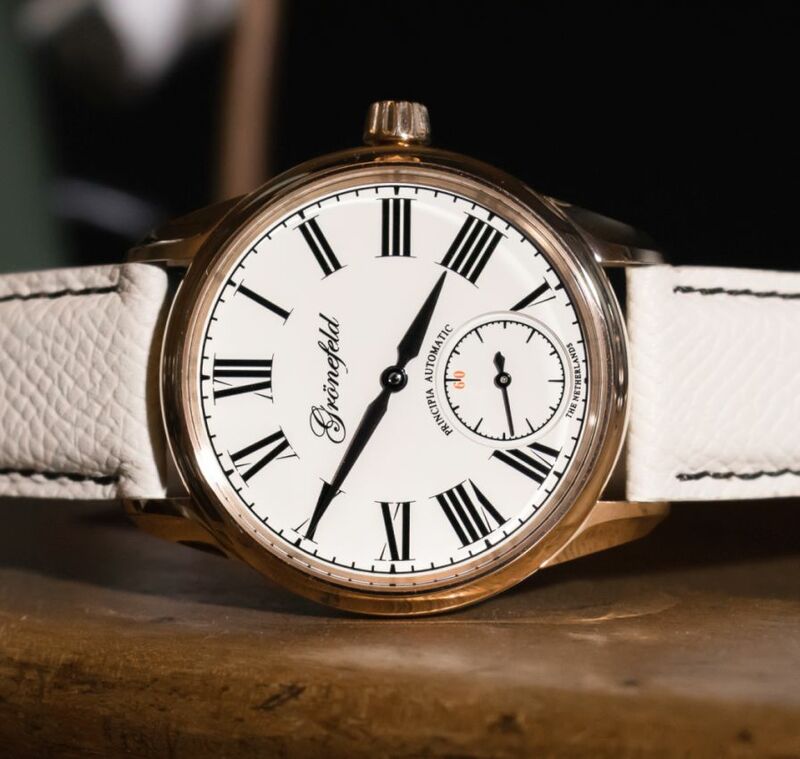 The cream lacquer dial features the same traditional logotype first used by Bart and Tim's Grandfather, Johan Grönefeld, back in 1912. 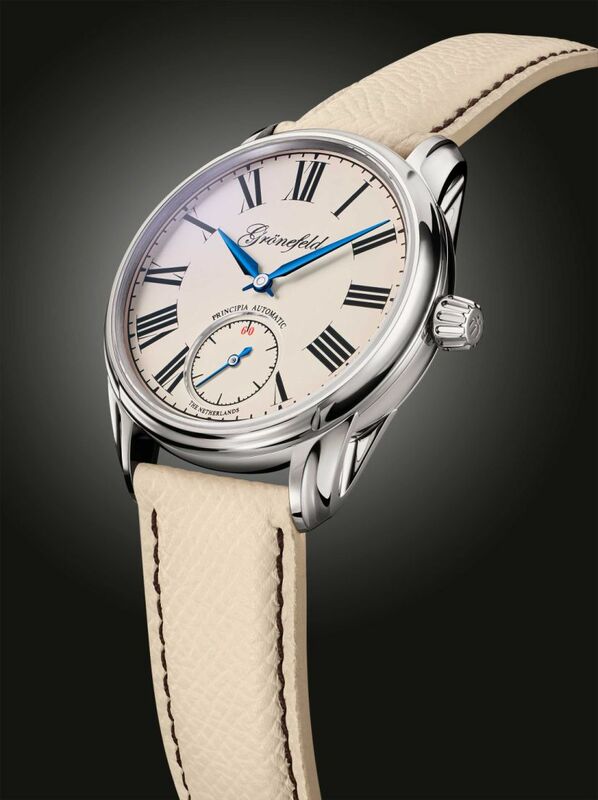 The extended Lancette hour and minute hands are flame-blued and include mirror-polished centers. In the lower portion of the dial is a small seconds display. A flame-blued hand with a counterweight traverses the display. 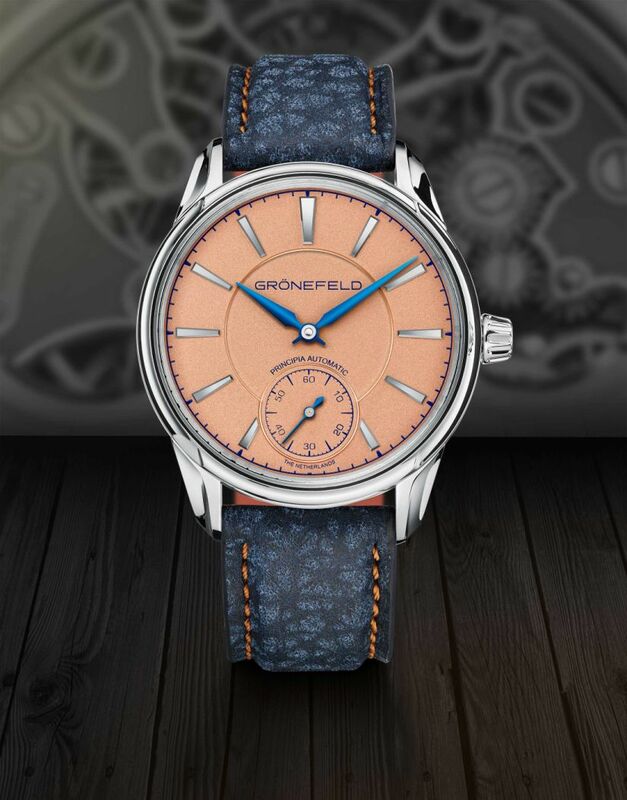 At the top of the subdial on the cream lacquer dial, "60" is shown in a subtle shade of orange. It is a patriotic reference to Bart and Tim's country of birth, The Netherlands. It is available in a variety of colored leather straps with matching metal buckles. It is delivered with a high quality, double axis, watch-winder made by Bernard Favre. Previous Topic: A nice golden pocket-watch case.